Bacon | "blackberry-eating in late September"
A few years ago my sister told me it would be nice if, in addition to number of servings, I included in my blog recipes how long the dish took to prepare. I grumbled inwardly about this, since pausing to take photos and make notations on my scribbled plans made any time span I provided an approximation, but decided it was a good idea and put it into practice. A little later, I started buying cookbooks highlighting Middle Eastern food written by an Israeli chef who works in Britain (by now you probably know who I’m talking about by now) who doesn’t typically provide an estimate of total preparation time for his recipes. More than once, I was caught by unexpected directions like “simmer 40 minutes” or even “let sit overnight” that I hadn’t noticed in my initial skim through the recipe, and suddenly dinner was off the rails. My fault for not reading carefully, but still, a little up front estimate would be helpful. Especially in the food blog world, in which I know some people read for the reading experience, but some people Google a main ingredient they are hoping to cook in the next hour, this time estimate seems particularly important. But again, especially in this forum in which we seem to have decided a story must precede the recipe, as I tell my students, you want to use your time efficiently. Thus if I promise you a perfectly smooth custard and you think “great, that’s dessert, let’s get started” to see only after reading about how well it went over at my latest dinner party that the custard base needs to chill for two hours, well, you’re back to your search engine and starting over again. All this to say, I think initial warning is needed, so as you can see above I’m instituting a new label: “Project Cook.” This is to designate a dish that is fairly complicated to make, or takes a long time, or uses multiple cooking methods, and thus you’ll know whether to avoid it or to launch in with a full and lazy afternoon to work your way through. As time and memory permit, I’ll go back and apply the label through the archives. Let’s work through what’s happening here: if possible, salt the pork a day or two before cooking. Everything I’m reading (and watching – have you seen Salt Fat Acid Heat yet??) lately about cooking meat suggests the seasoning process begins, and works best, in advance. It doesn’t get salty, but the seasoning takes a while to penetrate past the surface. The pork gets seared in bacon fat for a beautiful crust and some extra flavor. A medley of vegetables sweats down in the pork fat next, before everything tumbles into the slow cooker together with red wine, beef broth, orange juice, and some herbs. Eight hours later, you have a hunk of pork that practically dissolves at the prod of a fork. But we aren’t done there. The thing is, a lot of fat rendered out of that meat during its slow braise. Shoving it in the fridge overnight (after straining out the spent veg and herbs) means a.) the fat can be easily scraped off once it solidifies on top, and b.) your dinner prep the day of just got about 85% easier. All that remains to be done is to shred the pork, boil off the remaining liquid to reduce, and then crumble in crisp bacon to simulate the crunchy bits a great hunk of barbecued pulled pork has but a braise loses (alternatively, you can spread the pork out on a tray and broil it for a minute or two until some of the edges get crunchy, but I was too hungry to bother with all that). Of course you can serve this in any way you want, from the taco suggestion in the title to heaped sandwich filling to just a scoop on a plate, but we settled for mounding it into toasted corn tortillas and topping it with shredded cabbage, crumbled cotija cheese, sliced radishes, and a spoonful of guacamole. Oh, and some strings of pickled onions for that sour tang. Since there’s red wine in the sauce you can enjoy the rest of the bottle with dinner, but we opted for a lovely deep stout with orange and chocolate tones that paired perfectly. Cook the bacon in a large skillet over medium or medium-low heat until it is crisp. For me this took 15-20 minutes. Drain it on a paper towel and set aside until cool before refrigerating; we won’t be using it until Day 2. Turn the heat up to medium-high and carefully place the pork shoulder fat side down in the rendered bacon grease. It will sizzle aggressively; let it sear until it is golden-brown, at least 5 minutes. Repeat for each side, then remove the browned meat to the slow cooker. Lower the heat to medium and add the diced onion, celery, carrot, poblano, and the smashed garlic. Season lightly with salt and pepper, and sweat the vegetables until they are tender but not browned, around 10 minutes. Stir in the tomato paste, being sure it is well integrated. Transfer the cooked vegetables to the slow cooker with the pork. Add the red wine, the beef broth, the bay leaves and the oregano. Squeeze in the juice from the orange half, then add the spent orange as well. Pop on the lid and set the slow cooker to low. It will cook for 7-8 hours, until the pork is extremely tender. Remove the pork from the slow cooker pot and strain what remains, keeping the liquid and discarding the solids. Return pork and strained liquid to the slow cooker or to a vessel of your choice and refrigerate overnight. About an hour before you are ready to serve, remove your storage vessel from the fridge. While everything is still cold, scrape off and discard the layer of fat that should have collected on top. Remove the pork from the storage vessel and place it on a board. Use two forks to shred it into ribbons (this is easiest once the pork has warmed up a little). Place the liquid from the storage vessel into a medium pot on the stove (or just use your slow cooker on high heat, if it has that function). Taste and consider. Of course the flavor will be stronger when it has reduced, but if you feel like it just.. needs something, drop in a guajillo chile and/or a few squeezes of lime juice. Boil the liquid until it has reduced to a scant 1 cup; for me this took about 35 minutes. While the liquid is reducing, prep your accompaniments. When reduced, season the liquid to taste with salt and pepper, if needed, and more lime juice. Add in the shredded pork and turn the heat down to low, cooking just until the pork is heated through. Just before serving, crumble in the reserved bacon. If you want additional crunch, spread the warmed, sauced pork out on a tray and put it until a preheated broiler for a few minutes, until some of the edges have crisped and a few have charred here and there. Serve with accompaniments listed above, or your own favorites. One of my favorite games to play with N. when we are out, about in the world, is a riff on my favorite television show: Chopped (another favorite is noting a couple and trying to determine the status of their relationship based on their clothing and body language, and sometimes, how we think their evening will conclude. We are, clearly, lovely people). Specifically, he will tell me whether I’m to build an appetizer, an entrée, or a dessert, and will then list four random ingredients. Unlike the show, where the contestants have a mere half hour to create a meal that incorporates all four, I simply have to describe the dish I would make. I love this game. Like this year’s blog project, it gives me a chance to stretch my imagination; it’s like a trivia game, except instead of just knowing the answer, I get to invent it. Last fall we were waiting in line somewhere and N. gave me the following as an entrée round basket of mystery ingredients: halibut, bacon ends, vodka, and kale. 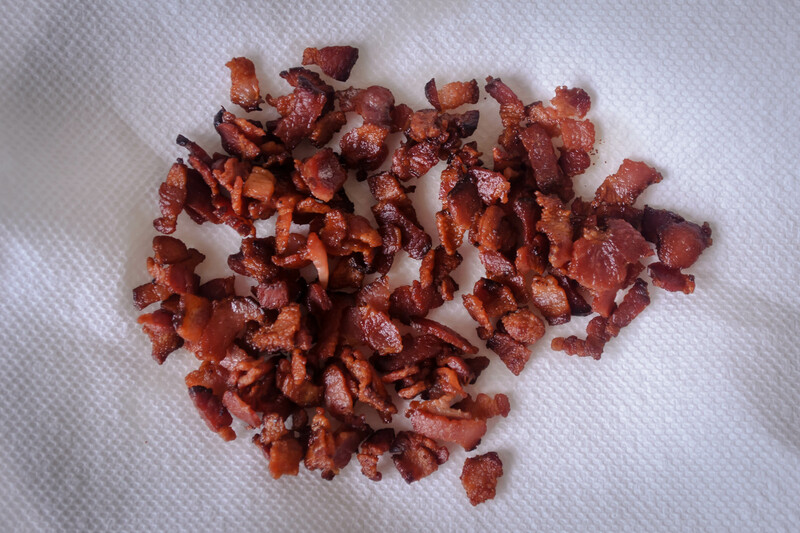 “Easy,” I said, and rattled off my entry: diced bits of bacon, rendered until crisp. Halibut cooked in the bacon fat with just a little bit of brown sugar. Bright kale sautéed until just wilted, then tossed with the crisp diced bacon, all balanced over a puddle of rich, creamy polenta and crowned with a few spoonfuls of some kind of vodka cream sauce. Typically, after the presentation of a meal idea, we discuss briefly and move on. This one, though, sounded so good that I decided I should actually make it. As this process usually goes, I then spent the next few months thinking about it, gradually adding layers and complications, and ultimately being influenced by the show itself for several of the components (notable the kale: in one episode a contestant slices kale across the grain into a fluffy pile of thin confetti before sautéing and salting so aggressively that judge Alex Guarnaschelli, on whom I have a relentless lady-crush, admiringly declares it somehow like a potato chip in addictive deliciousness). The dish I ended up making doesn’t deviate much from the original plan. I did indeed render the bacon, though I reserved some of the fat for the halibut and used most of it to cook the kale. In addition to bacon and salt, the kale also got a drink of vinegar to enhance the potato chip comparison. The halibut remained as envisioned: salt, pepper, a light sprinkle of brown sugar (at the suggestion of a bed and breakfast owner during a family vacation in Alaska when I was in high school), and a light sear until the center is just cooked, pearly and opaque. The polenta, which is fast joining mashed potatoes as a favorite starch option, ended up with some corn kernels thrown in, which is an easy but stupendous addition I insist you try. The vodka got flamed in some brown butter, then whisked with a bit of lemon juice and mustard to create a rich, barely emulsified sauce that tasted perfect on everything. I knew I was in love when, after only a few bites, I was already texting my sister to tell her about it. This is one of those dishes that is complicated only because it has multiple components, and you want them to be done at the same time. Therefore, though I’ve divided up the ingredient lists per element (polenta, kale, fish, sauce), in the procedure I’ve indicated when to switch back and forth between pans. Start with the polenta, since it takes the longest: combine the chicken broth, milk, and corn kernels in a medium pot and bring to a simmer over medium heat. Add the polenta, the salt, and the pepper, then whisk constantly until the mixture starts to thicken. At first it will seem like there is not nearly enough polenta; keep whisking. Once the mixture has thickened to a loose pudding consistency and is threatening to bubble, clap on the lid and turn the heat down to medium-low or low. Cook, stirring occasionally, until it is creamy and thick, and the polenta granules are tender, 15-20 minutes. Just before serving, add the 2 tablespoons butter and gently stir in until well combined. If the polenta is ready before the rest of the meal, hold it over very low heat, stirring occasionally, until the other components are ready. As soon as you put the lid on the polenta, place the diced bacon in a large skillet and heat over medium. Cook, stirring occasionally, until crisp, then remove to a paper towel with a slotted spoon to drain. Reserve 3 tablespoons of the fat and discard the rest. While the bacon is cooking, prepare the garlic and kale: cut the peeled garlic cloves into very thin slivers. Gather the washed and dried kale in a stack and, using a very sharp knife, slice the kale “against the grain” (perpendicular to the stem) into very thin slices. You are looking for the effect of shredded cabbage or kale confetti. Continue to slice down until the stems thicken – about halfway down the leaf. Reserve the remaining stem and leaf segments for pesto or kale chips. Pour two tablespoons of the reserved bacon fat back into the large skillet and heat over medium until it is shimmering. Add the garlic slivers and toast them until they are just starting to brown, about 45 seconds. Immediately add the kale all at once and cook 2-3 minutes, tossing occasionally, until it is bright green and barely wilted. Add the vinegar, salt, and reserved bacon pieces; toss to combine. Remove from heat and set aside until just before serving. To make the sauce, melt the butter in a small saucepan. It will foam up, then the foam will clear, and the butter will start to take on a toasted color. At this point, remove the saucepan from the heat and add the vodka. Once the alcohol is added, put the pan back on the heat. If you’re feeling brave, light a stick lighter and ignite the surface of the mixture; it will flame up just for a few seconds. Swirl the pan and the flame will go out, then simmer for 1-2 minutes to burn off a little more of the alcohol flavor. Add the lemon zest, lemon juice, and mustard and whisk to combine. Lower the heat as low as it will go, just to keep the sauce warm, and whisk occasionally to keep it emulsified. The last step is the halibut. In a medium skillet, heat the 2 tablespoons olive oil with the remaining 1 tablespoon reserved bacon fat over medium high heat. While the fat warms, season the halibut with salt, pepper, and brown sugar on both sides. When the fat in the pan is shimmering, carefully add the halibut filets. Cook, undisturbed, for two minutes, then carefully flip using tongs and/or a thin, flexible spatula, lower the heat to medium, and cook 3 minutes more until the fish is pearly-white in the center and flakes easily. As soon as you flip the halibut filets, put all the other components of the meal back over medium-low heat, just to warm through until the fish is ready. To plate, spoon a generous puddle of polenta in the center of a plate or a shallow bowl. Use tongs to add a generous pile of kale in the center. Balance the fish at an angle with one end on the pile of kale and the other in the polenta, then spoon the sauce over the fish; it will be thin, so it will spill into the kale and polenta. Serve immediately. Generally speaking, N. and I are boring restaurant attendees. One drink apiece, no appetizers, an entrée for each, and by then we are too full for dessert. The most exciting thing we do (hold your breath, folks) is to share plates, particularly when we are torn between what we want to order. This is likely borne out of graduate school poverty, though in a world of extravagant portion size it seems like a reasonable practice to continue. But once in a while, an appetizer or a side dish sounds so luscious, or so interesting, or so, I don’t know, good (are we still allowed to use that word? ), that we can’t resist it. At one of our more favorite haunts a week or two before the holidays, we were enticed by just such a side – a craggy mass of mashed potatoes threaded with strands of Brussels sprouts and bacon, a suggestion of cheddar, and broiled until the top was smattered with crusty dark bits. It sounded like a dream. It was… fine. As I ate it, I couldn’t help but feel that the flavors could have been stronger. More cheese. More bacon. More crunch. 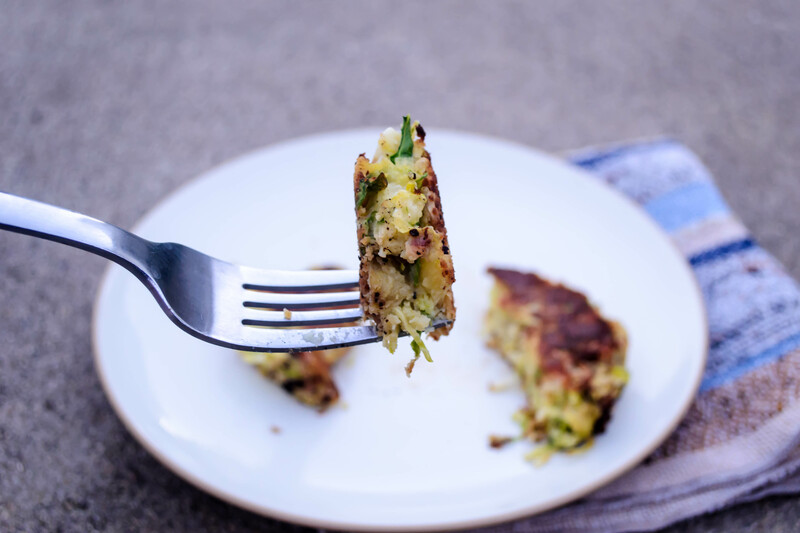 It needed to be, perhaps not a heap of mash subjected to broiling, but shaped into tender cakes and fried in a pan. 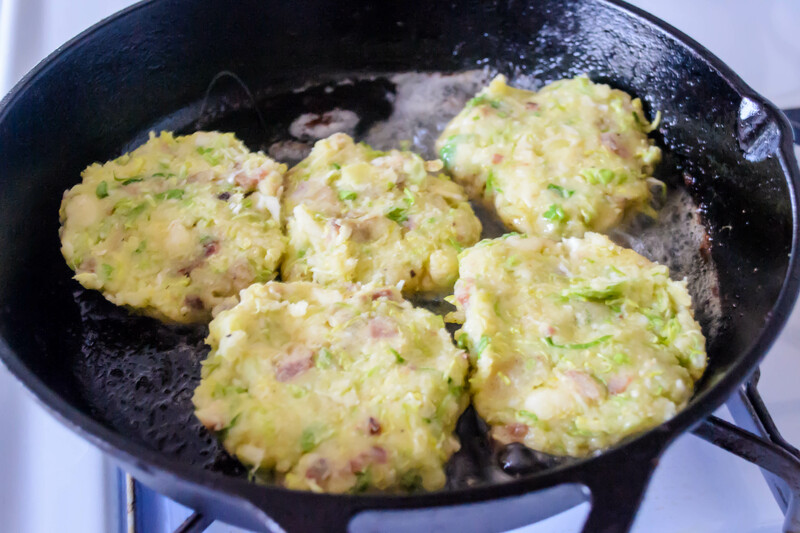 Yes, cheesy patties shot through with ribbons of Brussels sprouts and chunks of bacon, fried up in the very bacon grease the meaty bits had expelled as they cooked. Crunchy, creamy, melting, with enough green that a very imaginative person could just barely declare them virtuous. 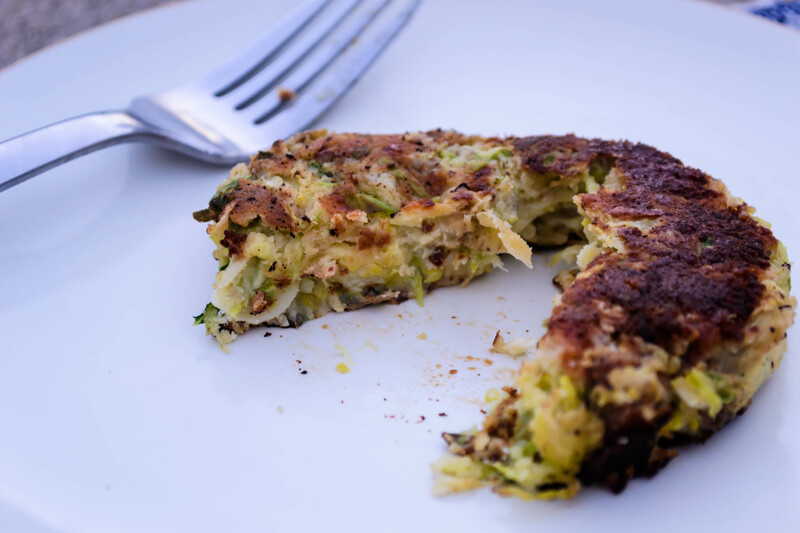 What I ended up with was a marriage of that classic British leftovers dish bubble and squeak (though certainly in a modern reinterpretation), and a latke so unkosher that we might as well have piled shrimp on top and called it a day. Yukon gold potatoes have quickly become my standard for mash (I could even call them the “gold” standard, but you might groan at that, eh? ), and this dish is no exception. Their flavor is terrific – hearty and rich – and they whip into lovely buttery fluff. And here, where texture is intentional, there is no need to peel them. The tissue-thin skins shred into the mix and echo the ribbons of Brussels sprouts. Chewy crisp hunks of bacon stud the cake with smoky saltiness, and do yourself a favor and use the sharpest cheddar cheese you can find – it needs to be saliva-inducing to stand up to the other flavors here. 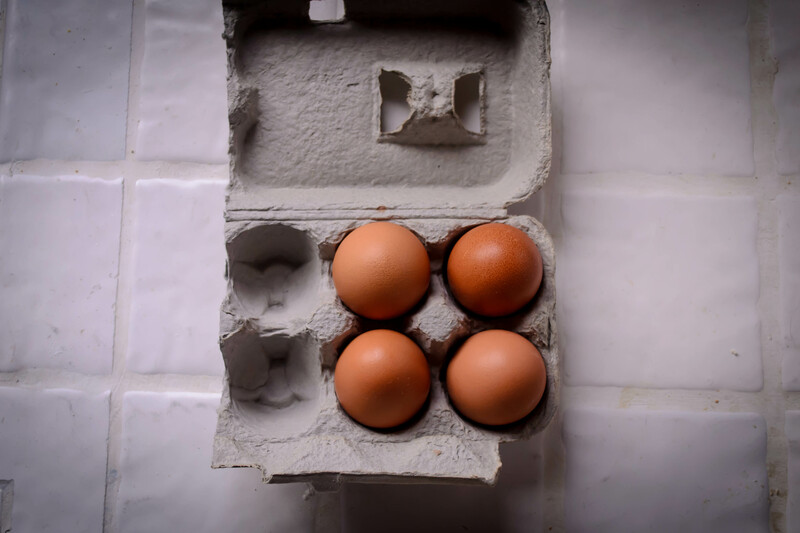 A single egg, lightly beaten and worked in, holds the cakes together, and then it’s just a question of heating up your cast iron skillet and frying them to order. I can imagine scarfing these for breakfast, lunch, or dinner, and I’m admitting nothing, but they are even acceptable stolen cold out of the fridge. *A note about bacon grease: I found, as I fried these, that bacon grease lends terrific flavor, but because it can be shot through with remnants of browned bits from frying the bacon, it can make the exterior of the cakes quite dark. To prevent this, as in the directions below, I recommend that you pour out the grease, reserving only a tablespoon or two. If you’re feeling particularly fussy, you can strain this reserved portion, but I wouldn’t be too worried about that. Discard the rest (or save for some other application) and wipe out your pan in between frying the bacon and frying the cakes. When it is time to fry again, combine the reserved bacon grease with some olive oil. You’ll still get the smoky, unctuous flavor, but the olive oil raises the smoke point and will produce a golden, rather than an almost-black, crust. Deposit potato chunks in a pot of salted water, bring to a boil, and cook until they are fork tender but not mush. This should take, depending on the size of your potato chunks, 7-10 minutes after the water comes to a boil. Drain and cool potatoes completely. While potatoes are cooling, fry the bacon pieces in a skillet (my preference is cast iron) over medium heat until they are golden, almost crispy, and cooked through. Fish them out with a slotted spoon and set aside on a plate lined with paper towels. Reserve 1-2 tablespoons of the grease, discard the rest, and wipe out the pan to clear any bacon bits residue (see note above). 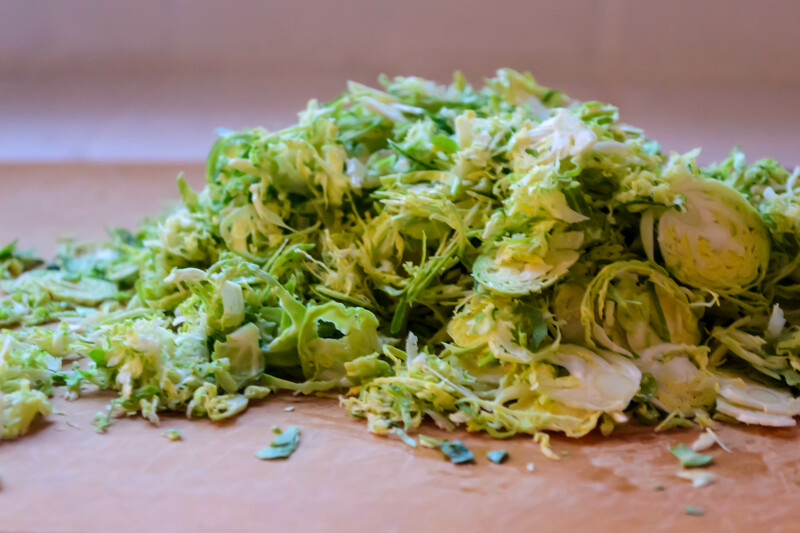 Using the slicer disc on a food processor (or a very steady hand and a sharp knife), shred up the Brussels sprouts into a mixture of ribbons and wafer-thin slices. By this time, your potatoes should be just about cool! When they are at room temperature, place them in a large mixing bowl and add the milk, salt, pepper, and garlic powder. Whiz them up with an electric mixer until more or less evenly combined. It won’t be a completely smooth mixture, because we’ve left the skins on, but it will come together into a buttery golden mash. 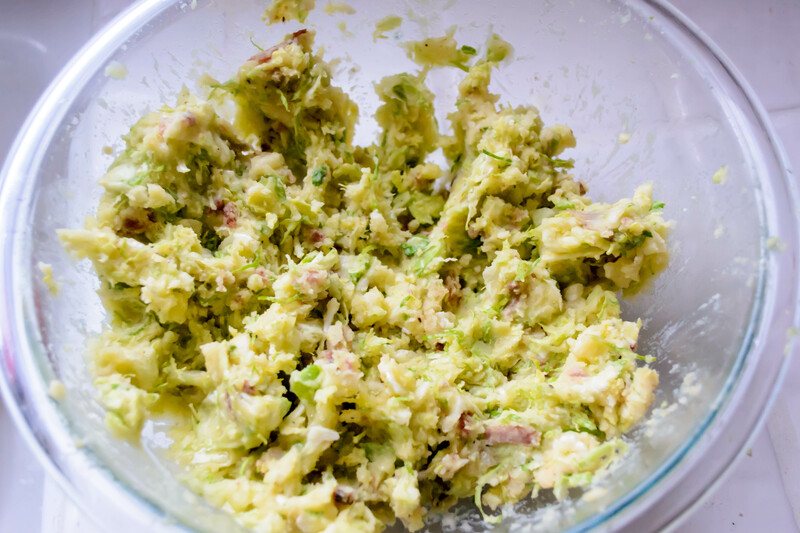 Add the cheese, Brussels sprouts shreds, and bacon pieces to the potatoes and mix well. I started out using a rubber spatula for this, but quickly switched to my hands, which did a much more thorough job. Taste for seasoning and add more salt, pepper, and garlic powder if needed. Add the lightly beaten egg and mix to combine. Using your hands, shape the potato cakes. Gently form rounds slightly bigger than a golf ball, then flatten them into patties about 3 inches in diameter. 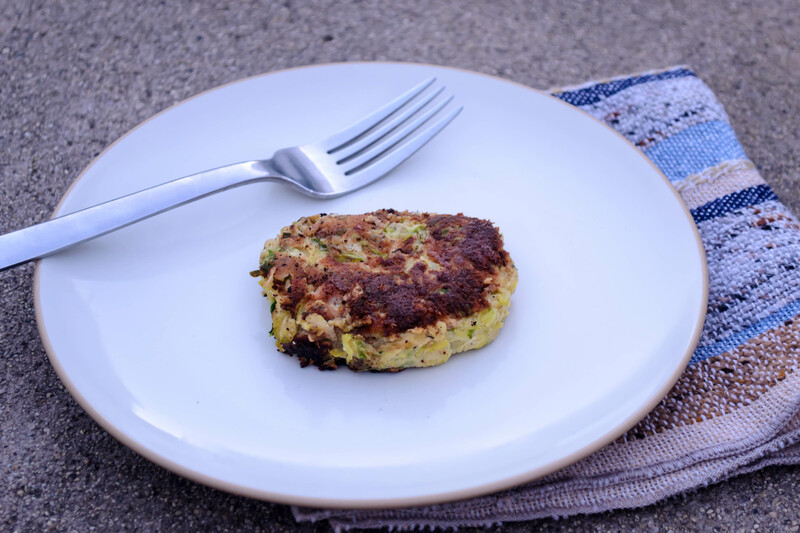 As you finish each patty, set it aside on a plate. 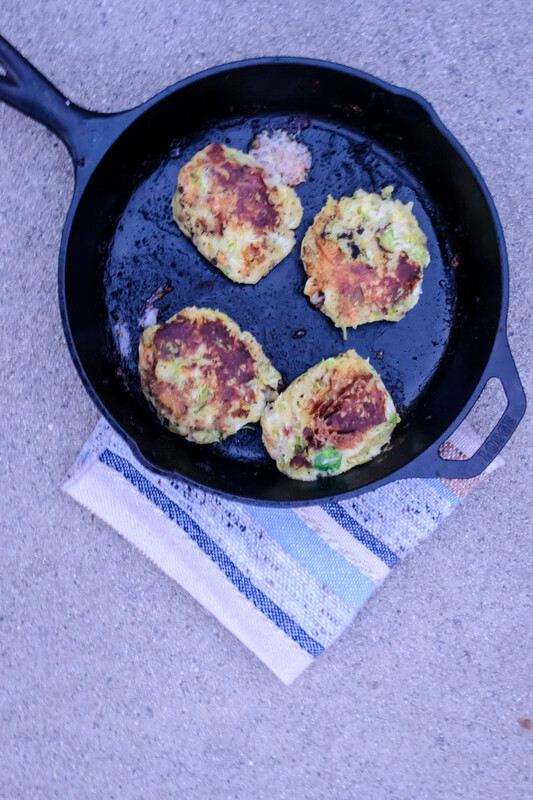 When your patties are formed, heat the olive oil and the reserved bacon grease in your skillet (to save on dishes you can, and should, use the same skillet you cooked the bacon in) over medium-high heat. When the oil shimmers, add the cakes. Don’t crowd them, though. Each one should have space around it – they shouldn’t touch one another. In my 9 inch cast iron skillet, 4 at a time was perfect. Once you have placed the cakes, don’t mess with them. Leave them alone for 4-5 minutes (4 minutes and 30 seconds was perfect for me) before flipping. You will need to do this with deliberation. Slide a thin spatula under each one quickly and firmly, then flip and leave alone for another 4-5 minutes. 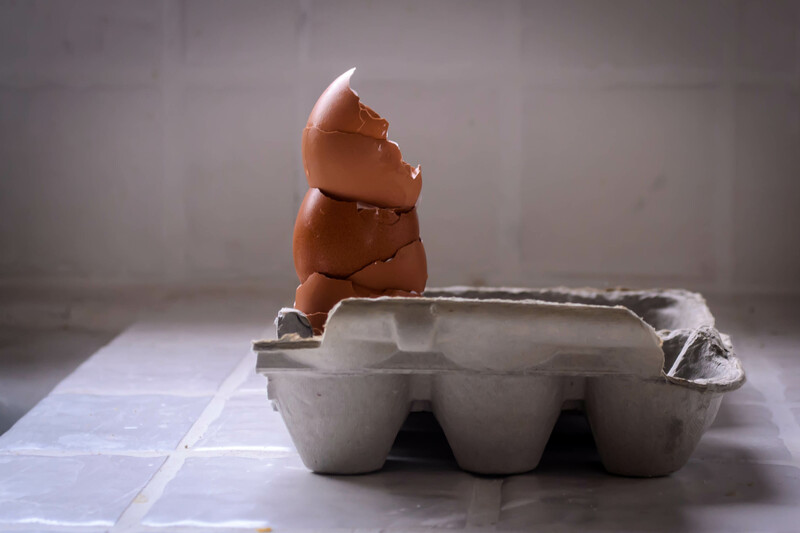 Disrupting the cakes too early, or fussing with them too much, will result in sticking, smashing, and general disintegration. They need time to form a stiff crust on each side before they will consent to flip cleanly. Continue, frying 4-5 patties at a time for 4-5 minutes on each side, until all cakes have been cooked. You may need another dollop of olive oil after a few batches to re-slick the skillet. If the oil starts to smoke or the cakes are frying up darker than you like, turn the heat down to medium. As you finish each batch, serve them immediately, or to hold them until all are cooked, stow on a cookie sheet lined with a wire rack in a 200 degree oven. As with all fritter-type beasts, these are best consumed as soon after taking them out of the oil as possible. I’m not going to say that my mom was a hippie or a health nut. She didn’t stock her pantry with wheat germ or homemade granola, and she didn’t feed us sprouted grains or tempeh (in fact, she probably didn’t know what tempeh was). But she did make a definite effort to keep food choices healthy when my sister and I were kids. Her rule for me when picking out breakfast cereal was that sugar had to be third or lower on the list of ingredients tapped out in tiny letters on the side of the box. I think the first time I tasted Lucky Charms was when I was in high school, where I was quietly surprised that anyone could think of eating this candy for breakfast rather than dessert. The first time I saw someone put sugar into a bowl of Corn Flakes, I was stunned. The only kind of cereal I’d ever put sweetener onto, besides oatmeal, was Shredded Wheat. Despite the commercials I drooled over for Sunny Delight (back when it wasn’t just a D) and Capri Sun, nothing but 100% juice (and the occasional lemonade concentrate) entered our fridge for a very long time. Brand name Fruit Roll-ups didn’t fly, but the occasional real pressed fruit leather was okay. My sister, seven years my junior, somehow managed to get Mom to buy Squeeze-its, but not until they had a “real juice” component. She also ended up with Lunchables to take to school (I didn’t find out about this until a visit home from college. I was shocked and felt a weird kind of betrayed jealousy – I didn’t want to eat Lunchables now; they looked disgusting! But I wanted to have been allowed to have them when I might have thought they tasted good. Is there even a word for that feeling?). Given all this, as you might imagine, white bread was not something that appeared in our (paper, please) grocery bags. But my sister and I were not sold on the breads my parents wanted us to eat. Whole wheat was pushing it a little, especially if it had cracked wheat spattered across the top crust. Oatnut and any kind of seven or nine or even five grain compilations were out. And then Mom found Country Potato bread. Do you remember it? It’s golden and mild, slightly sweet but still savory enough to taste good with ham and cheese. The top was often lightly dusted with some residual flour, which was somehow not offensive in the way the cracked wheat pieces were on the bread we refused. We ate potato bread for years. It was soft enough that, once you ate the crust off, you could roll the rest of it up into a mushy little ball, or tear the slice in pieces and make a whole pile of little dough-balls, and then eat those. They squished against our teeth. In the years since sourdough replaced potato as my bread flavor of choice, I’ve thought again about that bread my sister and I ate. How did they (whoever “they” were) get potato into bread? In what form? Was it mashed? Was it baked? Was it a flurry of potato flakes? Was it potato flour? At the farmers’ market in Eugene, OR my husband and I discovered potato donuts: dark brown, dense, sugar-crusted rings that were mercifully only available once a week, and I wondered about these too. Two beloved starches, baked together, could only be greater than the sum of their parts. This is all an extremely long way to introduce the idea of putting potatoes in a biscuit. If they can produce bread and donuts, and of course pasta – gnocchi is not, when it comes right down to it, really so tremendously different from a row of fluffy little miniature biscuits that you boil instead of baking – why not a tall, leavened biscuit? A little internet research showed me numerous methods of incorporating potato flavor into my biscuits. I decided early on that I wanted to use a fresh potato, rather than the instant potato flakes some recipes recommend, which meant I had to be careful about moisture. 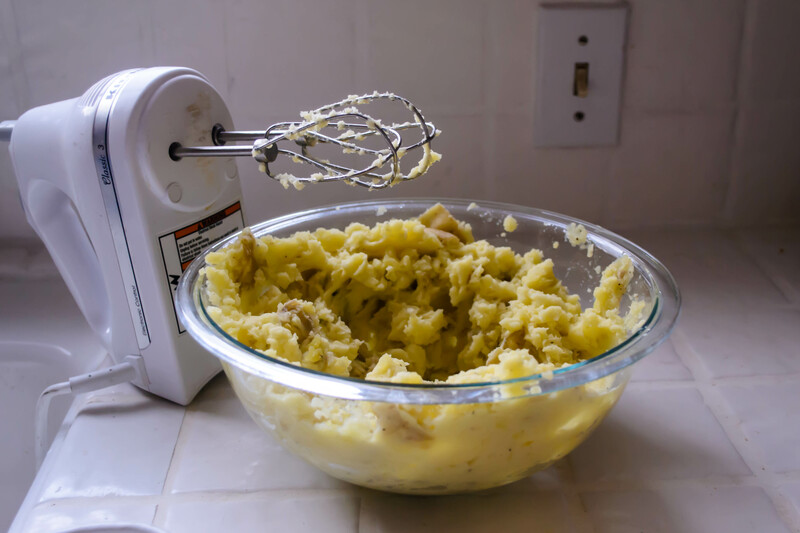 The potato needed to be cooked and mashed or pureed before adding it to the flour, so that it mixed in easily. However, boiling potato chunks to mash them does add water, and I wanted to keep my potatoes dry so that the moisture could come from something with additional flavor – I was thinking buttermilk. Here, gnocchi was the answer. To avoid adding too much water, here or in those pillowy little nuggets, the potato is baked and then grated into crumbly, starchy strands, which are then easily smashed into smoothness. 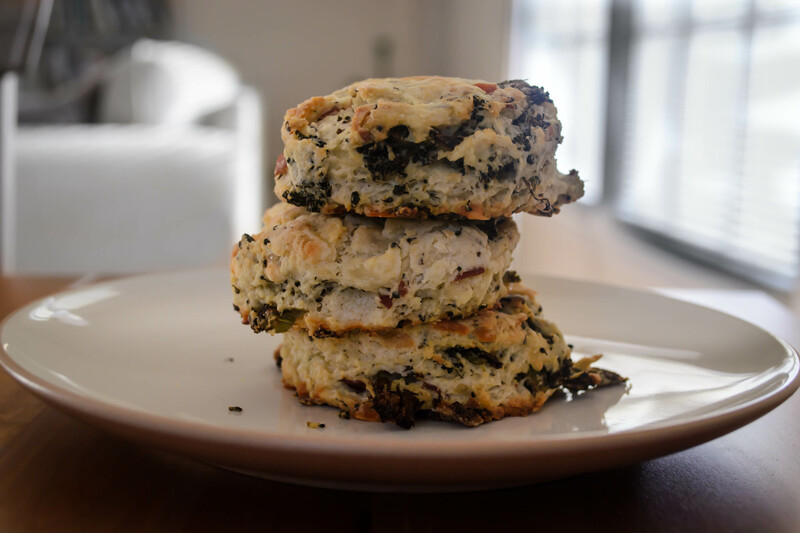 I’m rarely contented with a plain old buttermilk biscuit, so I decided some add-ins were in order. Since I was already playing with the potato idea, I started thinking about loaded baked potatoes: cheese, broccoli, bacon bits, sour cream, green onions… I had a roommate once who liked to top hers with salsa and cubes of fried tofu. In the end, though, I decided to keep the excess to a (relative) minimum: crisp shards of prosciutto, sharp cheddar, and a pile of roughly chopped roasted broccoli florets. This produced a dough that clung together reluctantly, given how jammed with additions it was. But I was patient, after I’d finished throwing flour everywhere, and gentle, and managed to punch out 12 biscuit rounds jammed with bits of green and pink poking out every which way. 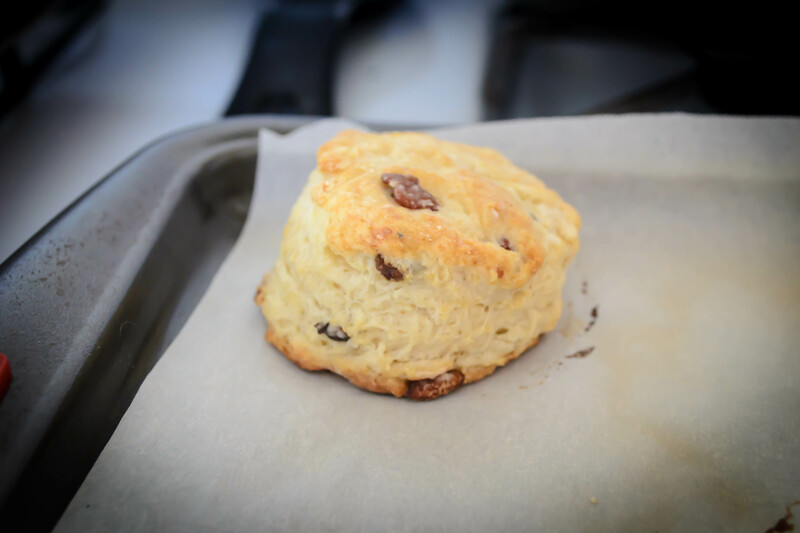 This is a dense biscuit, so it doesn’t rise a tremendous amount when it is baked, but it will still puff a bit as the chunks of butter struggle to support the spudsy weight. It emerges speckled with bits of broccoli and browned cheese, and it’s totally worth it in every way. Guys, you have to try these. It’s rare that I run out of food words to describe something, but this is one of those times. If I jammed all the superlatives I was thinking of using into this post, you probably wouldn’t believe me. I’ll keep it at this: the cheese and the broccoli and the prosciutto all lend a crazy-good saltiness (the prosciutto could easily be taken out to make this vegetarian). 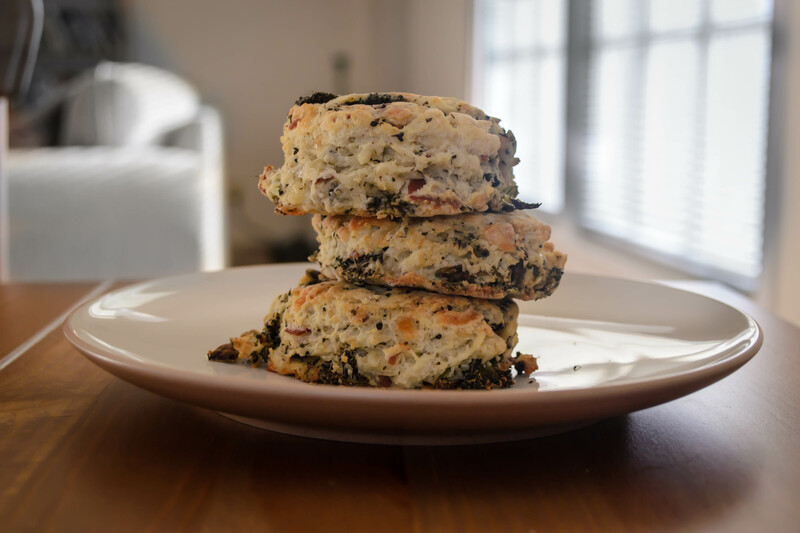 The flavors are perfect together, and though the potato doesn’t have a lot of flavor on its own, it does make this biscuit fairly substantial. Paired with a salad (as we had), or a nice bowl of soup, it’s basically a complete meal. As with all biscuits I’ve ever tasted, these are best on the first day, as hot out of the oven as you can stand to touch them. They are perfect on their own, though if you wanted to split one open and add a pat of butter, I’d completely understand. They are, after all, related to baked potatoes. And if you wanted to top them with a roasted garlic or a white pepper gravy, well, I don’t think I’d be in any position to stop you. Bake a medium to large russet or other fluffy, starchy potato at 400F for about an hour, or until a fork sinks easily through the middle. When it is cooked through, let it cool completely. Splitting it in half will hasten this process. Using the largest holes on a box grater, grate the potato flesh away from the skin. In a large bowl, smash or crush the crumbly bits of potato into a smooth mash. Preheat the oven to 425F. 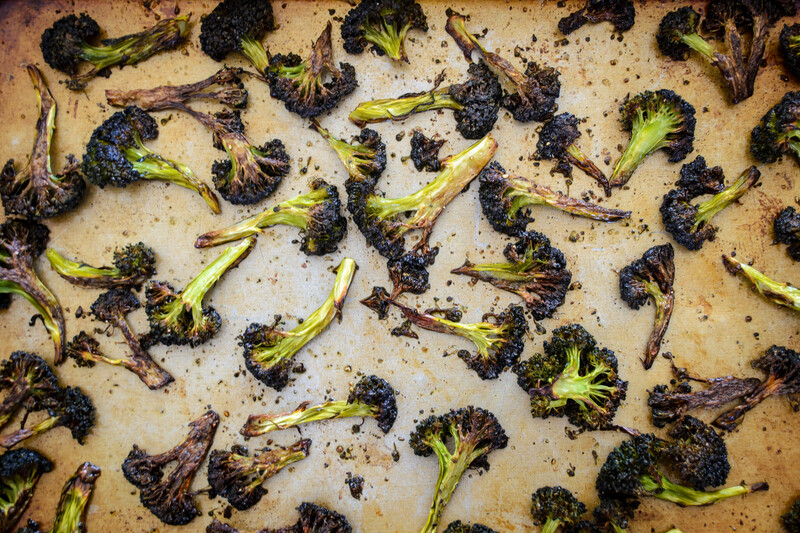 On a baking sheet, toss the broccoli with olive oil, salt, and pepper, and roast for 30-45 minutes, flipping the broccoli pieces over halfway through the cooking process. When done, they should be well browned on the outside and tender in the middle. The flowery bits will be crisp, like broccoli popcorn. Remove the broccoli to a plate or cutting board to cool. When cool enough to handle, chop into ½ inch pieces. Place prosciutto strips onto the now-empty baking tray (yes, there will be some broccoli bits and residual oil there. 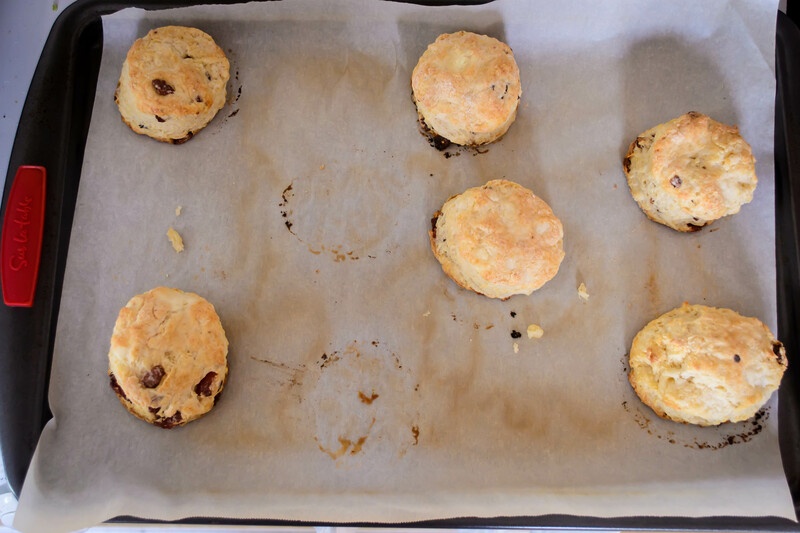 Don’t worry about it – they are all going into the biscuits together!). Bake for 10-15 minutes, or until prosciutto is crisp. Watch it carefully: it burns easily. When crisp and dry, set aside on paper towels or a wire rack to cool and drain a bit. Once cool, cut or crumble into bits. 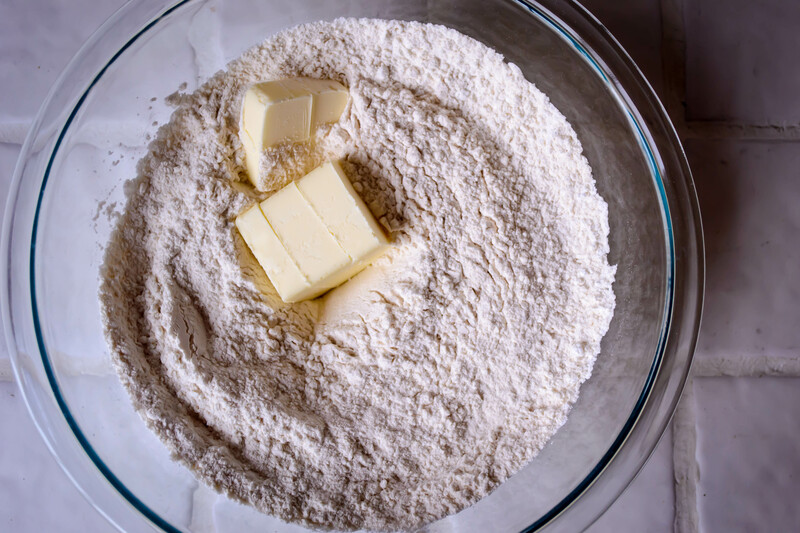 In a large bowl, whisk together the flour, mashed potato, baking powder, and salt. You want a homogenous mixture: no big potato chunks. Using a fork, two knives, or (my favorite) a pastry blender, cut in the butter until it is the size of large peas. This will also help break up any remaining hunks of potato. Add the cheese, prosciutto, and broccoli, and incorporate until they are distributed evenly. Add buttermilk and stir with a fork. 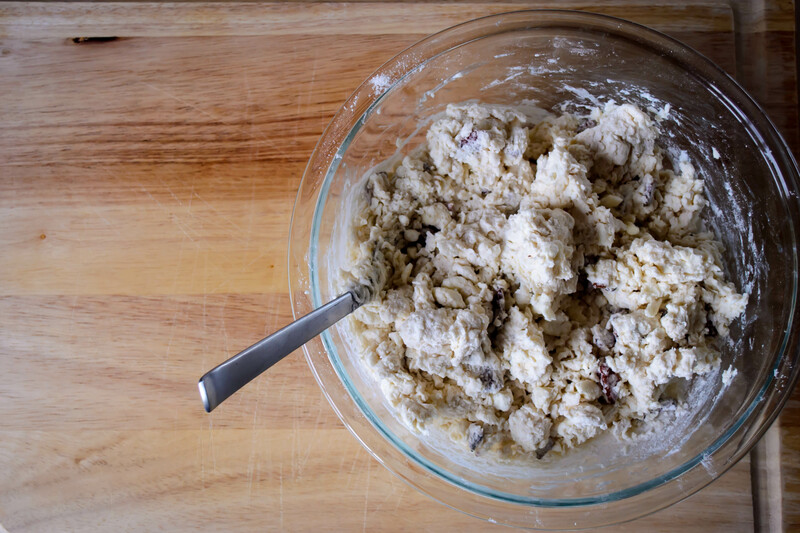 You are looking for everything to combine into a rough, shaggy-looking dough. 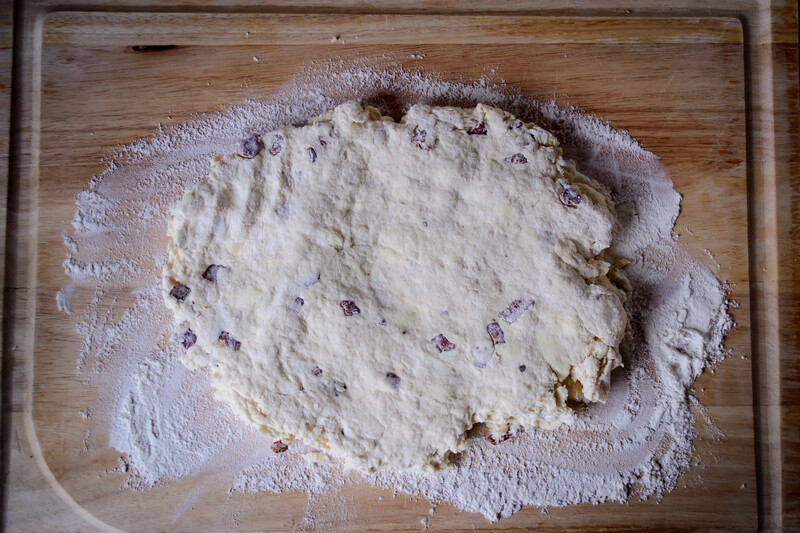 Turn your dough out onto a well-floured board and knead it a few times with the heels of your hands until it is more willing to cling together. Press it out into a rectangle or circle about 1 inch thick. Using a biscuit cutter or the floured rim of a drinking glass, punch out biscuits by pressing straight down, NOT twisting. This will help the biscuits rise better by not disrupting their layers. 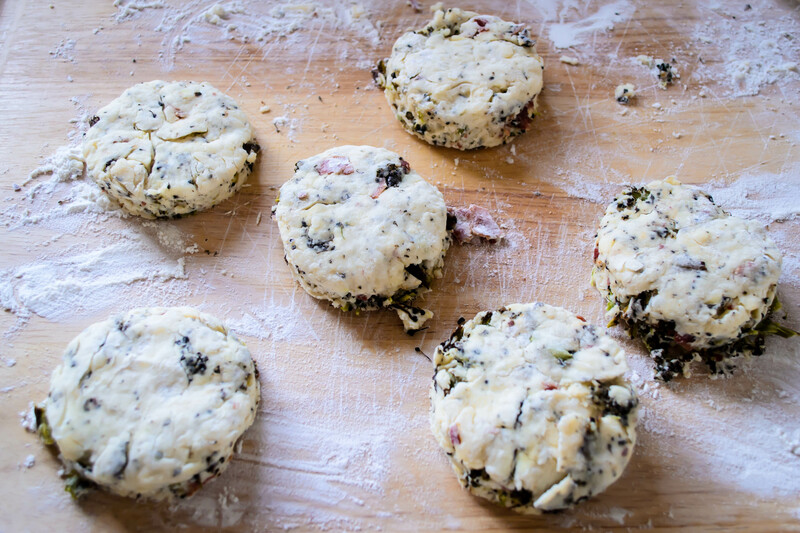 Once you have punched as many as you can from the dough rectangle, gather the scraps, knead them together once or twice, and press the dough out again. Continue until no more dough remains (making one or two funky-looking biscuit bits is totally acceptable: you can call those the cook’s tax and gobble them while no one is looking). 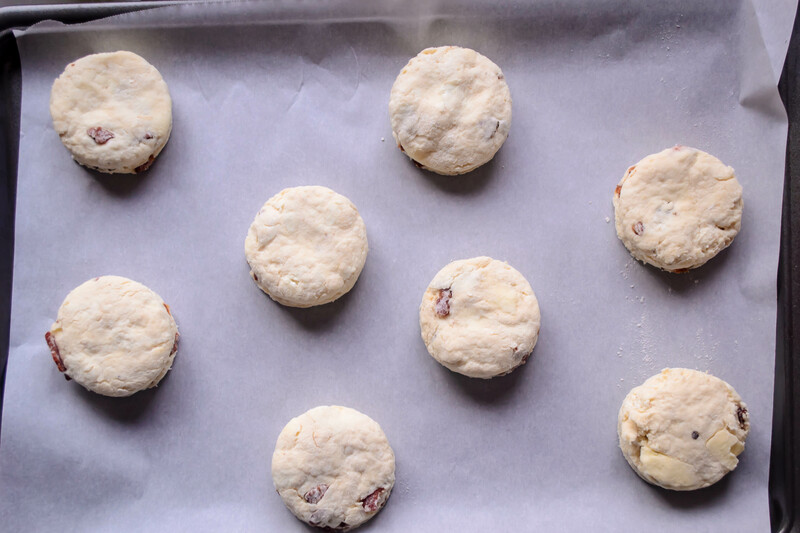 As you punch out biscuits, place them on a greased or parchment lined baking tray. Bake in a preheated 425F oven for 15-18 minutes. Eat while hot, warm, or room temperature, if you can wait that long. I’m not one of those people who is crazy for bacon in everything. The idea of pairing it with chocolate still weirds me out a little, and I’ve never tried it in brownies or ice cream. That being said, bacon is probably the top reason I would have trouble being a vegetarian. Crisp, sandwiched with some dripping heirloom tomato slices and lettuce on toasted sourdough, and I’m dreamy happy. Salty fatty fried chunks studding my bowl of baked beans, and my evening is made. What I am generally crazy for is breakfast. But not at breakfast time. I can’t handle a big savory meal early in the morning. A fried egg sandwich, okay (and with a little sriracha in the mayonnaise? Be still my heart!). A pancake or three, maybe on occasion. The big, multi-course breakfast is, for me, wasted on the morning. I’m a breakfast-for-dinner kind of girl. This week, in need of comfort as spring break drew to a close and allergy season burst wide open, we decided breakfast sandwiches were just what we needed. 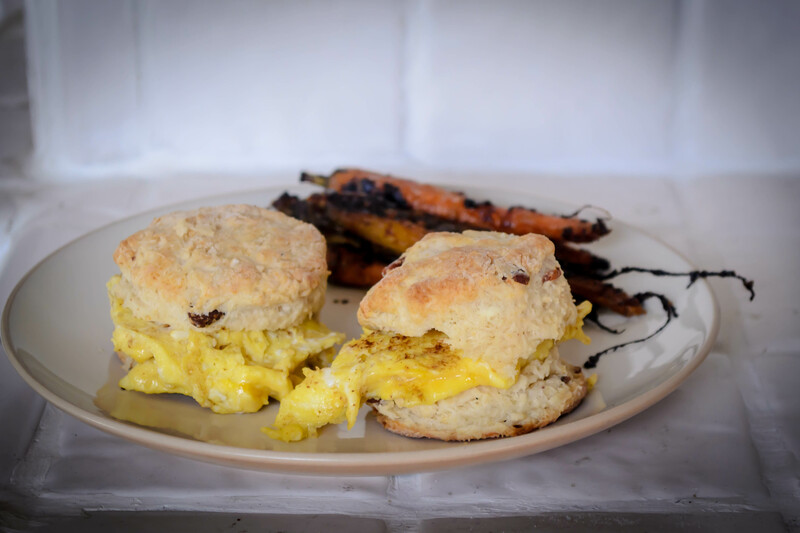 Eggs, bacon, fluffy buttery biscuit, and why not, a little goat cheese?! But layering these components together would not suffice. Thick slices of bacon smashed against a cloud of scrambled egg and crumbles of goat cheese seemed like a mess waiting to happen. I’ve incorporated cheese into biscuits before with great success, why not do the same with the bacon? 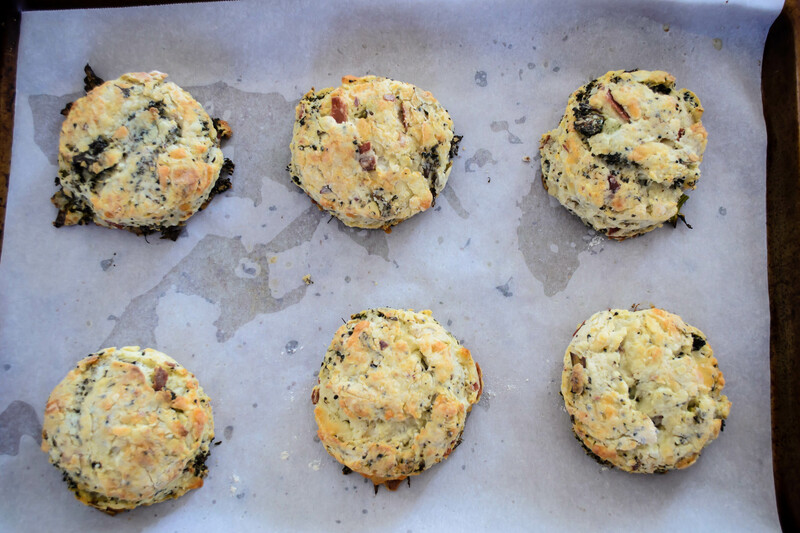 The result: goat cheese bacon biscuits. A simple revelation, but let me tell you, a spectacular base for a scrambled egg sandwich. Crisp squares of bacon, cold cubes of butter, crumbles of chevre, and a healthy glug of buttermilk. The funny, blackened stakes lying in a pile in the background of this photo are roasted rainbow carrots. They were incredible. And don’t just take my word for it – I knew they were the real deal when N. carefully sampled one, turned to me, and said “wow.” If you’ve been reading this blog for any length of time you will know that N. is not intentionally grudging when it comes to food praise; he’s just not particularly effusive about it. A “wow” is like fireworks. Breakfast-for-dinner slam dunk, then. What’s your favorite? Preheat your oven to 400F and line a baking tray with parchment paper. In a medium bowl, combine the flour, baking powder, sugar, and salt. Whisk in the cooled, crisp bacon. Add the butter and incorporate using a pastry blender or your hands. When the chunks are about the size of lima beans, tumble in the goat cheese and blend it in until there are no more large pieces. The pebbles of butter should be about the size of peas when you are done. Pour in the buttermilk and fold it into the dry mixture. I find using a fork works best for this – the tines pick up and jostle around the flour mixture better than a spatula or wooden spoon. Don’t overmix, but be sure the buttermilk is well incorporated. When your mixture is evenly damp, abandon the fork. 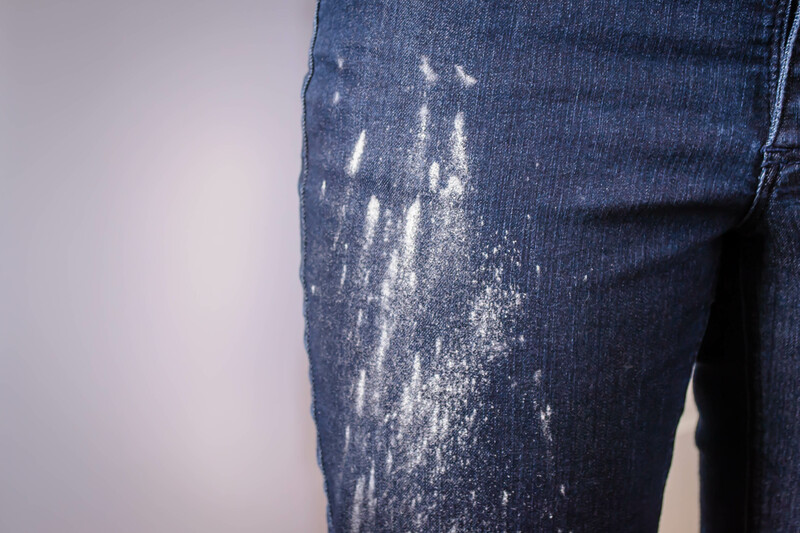 You can turn the whole mess out onto a floured board, or you can just reach in with flour dusted hands and knead the dough a few times in the bowl until it comes together. 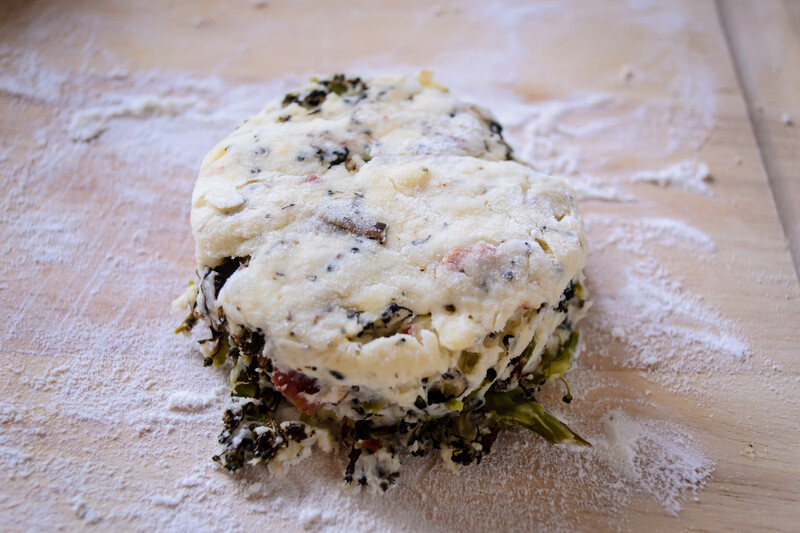 Pat the dough into a plump something-like-a-rectangle on a floured board. The thickness and therefore the size of the rectangle is really to you, but mine was probably just under an inch thick. 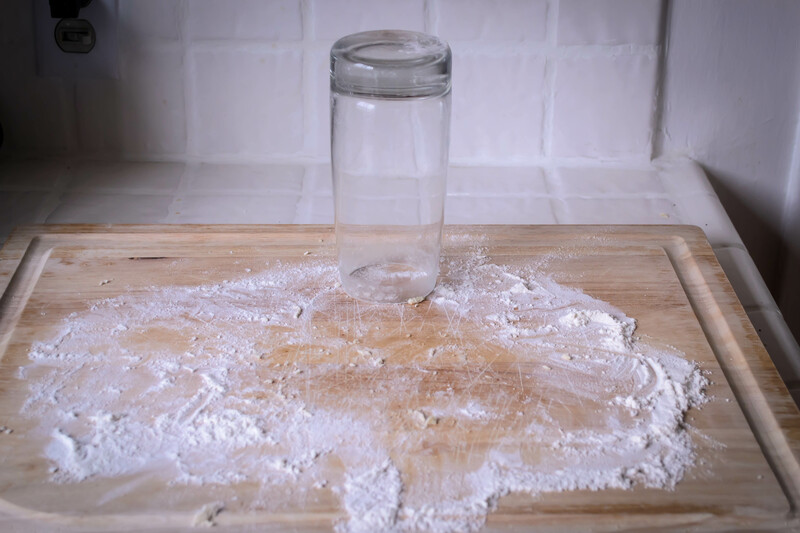 Using a biscuit cutter or the floured top of a glass, punch out biscuit rounds by pushing straight down all the way through the dough. Don’t twist your cutter as you go down; you’ll disrupt the craggy layers in the dough and the biscuit won’t rise as high or as evenly. 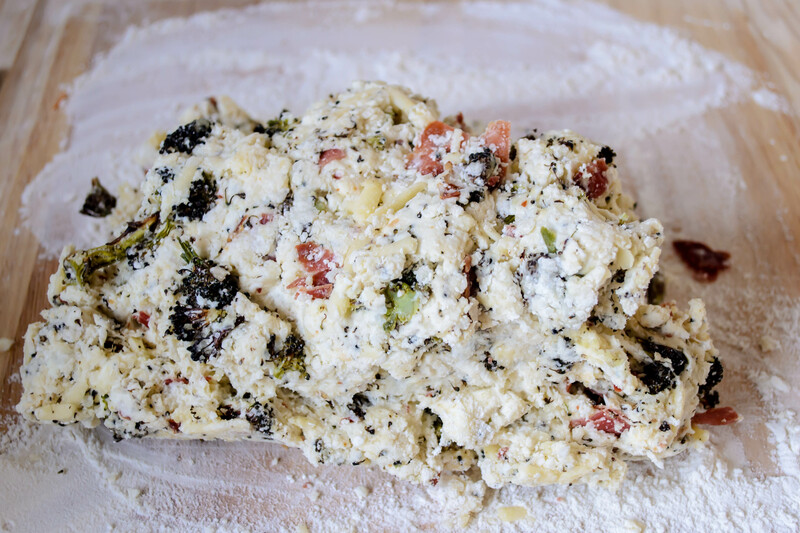 When you’ve punched out as many rounds as the rectangle of dough will allow, place them on your parchment lined baking sheet at least an inch apart, gather the dough scraps, knead them together a bit, and pat them back into a new rectangle. 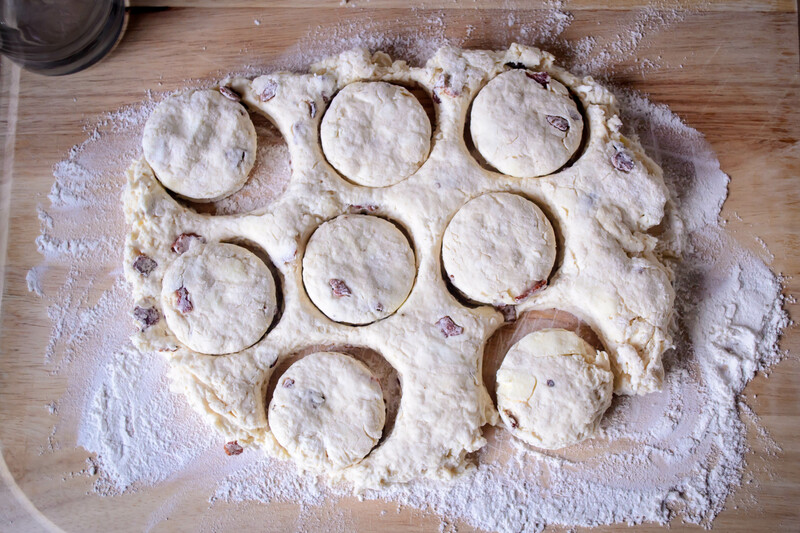 Continue punching out biscuits and reshaping the scraps until you run out of dough. Given the small size of cutter I chose, I managed 16 sweet little biscuits. You will have more or less depending on size and thickness. For a small biscuit (2 inch diameter), bake at 400F for 12-14 minutes, or until the layers have puffed and the top is golden. Larger or extremely thick biscuits will take longer; try 15 minutes to start. If you just want to eat them as is – and I’d sympathize completely if you did – you’re all set to go. Dig in. If, however, you want them as sandwiches, split them down the middle of the puffy, buttery layers and insert a fold of softly scrambled egg. These are best the day they are cooked, so I’d advise only baking as many as you and your dinner partner(s) are going to eat. The remaining biscuits can be frozen, still unbaked, and enjoyed another day. To freeze them, set them on a piece of wax paper or parchment in a single layer on a plate or baking tray. Wait until they are frozen, then relocate them to a zip-top freezer bag. They don’t even need to be defrosted, just pop them into a preheated oven for a few extra minutes (maybe 15-18 for a small biscuit) and dinner – or breakfast – is served! The problem with cramming for final exams – as many of my students were doing only a few weeks ago – is that you end up trying to process too much information, and just as quickly as you learn new things, the old things you thought you knew start sliding away. That’s the glory and the power of writing. Once it’s on the page, it’s solid. No matter how many holiday dinners you eat (I’m onto my third or fourth at this point), those words will still tell you exactly what you did and (sometimes) how you felt about it. I feel like I’m cramming for my final. Last week, before the holiday, before the family time, before the outpouring of memories and laughter and swallowed tears of all kinds and barking and yelling and joy, I made three Bittmans in a desperate bid to stay on top of the project. Line a small baking dish (I used a 9” cake pan) with aluminum foil and drizzle the foil with olive oil. Brush or rub the olive oil into an even layer so every millimeter of foil is covered. Set the sprouts, cut side down, on the oiled foil, spacing them evenly so none are touching. This will ensure even roasting rather than steaming. Roast for 15 minutes, until the cut edges are browned and just crisp. Using tongs, flip over each sprout so they teeter on their curved sides. Roast for another 15 minutes. While sprouts are roasting, cook the bacon. Mine was already cooked – saved from another porky occasion – so during the last five minutes of sprout roasting I added the bacon pieces to the pan to heat them up a little. When the sprouts are browned and lightly tender, set them aside until they are cool enough to handle. As soon as you can bear to touch them, add a tiny spread of mustard across one cut edge, seat the bacon atop it, and place another sprout half on top to complete the sandwich. Drive a toothpick through the whole thing and serve as an hors d’oeuvre. We gobbled these down like we hadn’t eaten in weeks. They were delightful and I highly recommend them as a party item: crisp bacon, zesty mustard, and the nutty crunchy slight bitterness of roasted brussels sprouts, all collected together in one perfect bite. Perhaps a New Year’s Eve treat to help the hours pass. Soup and bread seemed like a good meal to follow our sprouts. I followed these directions fairly exactly, with the exception that I used only half an onion. The olive oil and onion went into the oven for five minutes at 400F, at which point the onion slices were sizzling and the oil was shimmering beautifully. Bittman neglects to note where and when to add the sage, so I stirred a tablespoon of finely chopped fresh sage into the batter just before adding it to the skillet. This concoction baked for 45 minutes, until it was set, the onions were crisp-tender, and the whole thing loosened easily from the skillet and slid almost gracefully onto a serving tray. We cut large wedges and tasted. It was unlike any other bread I’ve come across – more like baked squares of polenta than anything else, which made sense when I stopped and thought about it. Were I renaming this dish, I think I would call it Polenta Pizza. It was well oiled and spongy in texture, squishing pleasingly between our teeth and driving us back for additional tastes. N. wasn’t sure he liked it at first, but then he went back for a second slice and then a third. When I ribbed him about this, he said he was still deciding what he really thought, and needed more samples to truly make up his mind. This odd little bread course could easily be dunked in saucers of warmed marinara sauce, or sprinkled with mozzarella or parmesan for a pleasing salty bite. Though the onions and sage were good, you could probably saute almost anything in that skillet before adding the batter: sausage, peppers, mushrooms… anything you’d put on a pizza. A decadent appetizer and a well-oiled pizza/bread need a sober, sensible kind of soup to balance them out. I heated 2 TB olive oil over medium heat, then tossed in the onions to sweat for a minute or two before adding the garlic and the other vegetables. When the onions were translucent and tender, I added the tomatoes, lentils, and broth and turned the heat up to medium high until the whole pot came to a boil. Once boiling, I gave it a healthy stir and then turned the heat down so the soup would just simmer, letting the lentils soften gently and the vegetables tenderize. Simmer for at least 35 minutes, then taste the lentils to see if they are tender enough for your taste. We like them soft but not mushy, with minimal resistance but still able to hold their shape. Just before serving, squeeze in the lemon juice, stir gently, and dip into serving bowls. Scatter the surface with a grassy sprinkle of parsley. We liked this, though it wasn’t the best lentil soup I’ve ever had. The flavors were enticing and the lemon juice made it a bright, rather than heavy, soup. The problem with it was that I like my lentil soup more like a stew or a chili. The brightness of the lemon made the shower of shredded pepperjack cheese I was considering adding seem extraneous and out of place, and I tend to get crotchety when denied cheese. But alongside the flatbread and the richness of the brussels sprouts, it was hearty but didn’t weigh us down. 2012 is fading like the last sheen of daylight across the hills in winter. 2013 charges toward us, all mystery and sharp promise. I thought about cheating and saying I was done; these three dishes are the final three, I made it, all boxes are checked, all questions answered, funtoosh, kaput (extra points if you can name my source! ), but I just can’t. I’m too close. This final exam is too important. This resolution needs to be one I keep. I have two dishes left. I have two days, one of which will be spent driving from the Sierra Nevada foothills where N.’s parents live back to Los Angeles and my little house. I hope I’m going to make it. The finish line is in sight. Now I just have to stagger across it.